Supplementary material reads: "Gershon. City desk. Illus. Monday. Elks convention. Officers of the Elks Lodges of Southern California were guests of the San Pedro B.P.O.R. 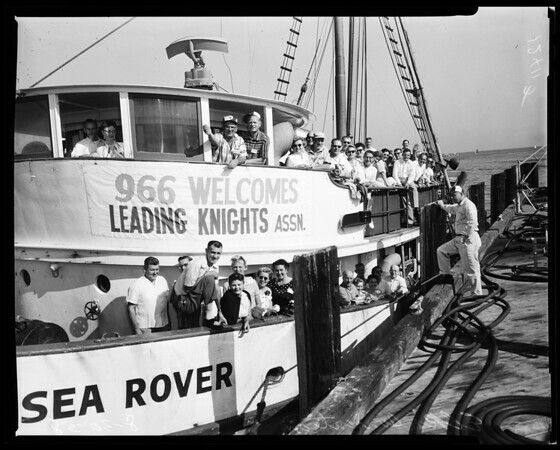 966 Lodge who hosted them on a tour of Los Angeles Harbor on the fishing boat Sea Rover and then a dinner dance at the Lodge, 207 West Seventh Street. San Pedro's Exalted Ruler Gordon McCorkell stands on dock as visitors left on Sea Rover for harbor tour. McCorkell couldn't go along because he had to oversee plans for dinner-dance at Lodge. In boat's window with hand to right are Capt. Nick 'Barney' Marinkovich and Ivan Morriss, Esteemed Leading Knight of San Pedro's Lodge, chairman for the day-evening."